"...We were also absolutely blown away by the film which manages to convey more about NewYork and its history than one could imagine ever being crammed into 18 minutes." "a fast-paced, state-of-the-art film...on the history of New York City." "NYC film is a visual explosion." "Just go watch the 18 minute video about New York. It makes me so darn proud to be part of this hunk of rock!" 'New York Story', [whisks] through New York history with lighting effects, constantly moving screens and a projection of almost IMAX-like proportions. I have organized several group tours…and everyone was impressed with the knowledge and enthusiasm of the docents who have such a command of the exhibition. A good starting point for your visit to New York. It will help you understand the people and history of this amazing city. When I talk to friends, I explain the New-York Historical Society's appeal to me by a simple phrase: "I never walk through the doors of the Society and not learn something." What better reason to visit? No trip to manhattan can be without visiting here. One of the greatest museums in the city! I always enjoy visiting the New-York Historical Society. Their permanent collection has Tiffany, Audubon and the Hudson River School painters. Their special shows are also fabulous and diversified. There are men's and women's restrooms on each floor of the museum. There are three unisex restrooms on the first floor. All restrooms are wheelchair accessible. Baby-changing facilities are available in the men's and women's restrooms on the lower level, first floor, and fourth floor. New-York Historical Society galleries as well as the DiMenna Children’s History Museum are stroller friendly. Collapsed strollers may be left at coat check (space permitting). New-York Historical Society facilities, galleries, and auditorium are wheelchair accessible. A wheelchair accessible entrance is located at 2 West 77th Street. Wheelchairs are available to visitors free of charge. It is advisable to reserve in advance by calling (212) 485-9200 or (212) 873-7489 (TTY). Please ask security for assistance when you arrive. Most exhibition audio and video including all media in the DiMenna Children’s History Museum is accessible to t-coil hearing aid users. T-coil compatible audio guides are available and are free with admission. Headsets and neckloops are also available. Please inquire at the admissions desk. The Robert H. Smith Auditorium is equipped with an infrared assistive listening system. A t-coil option and neck loops are also available. Please ask a staff person at the entrance to the auditorium. 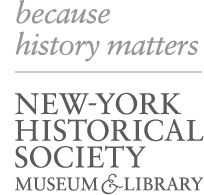 All New-York Historical Society exhibition films are open captioned. American Sign Language (ASL) interpreters are available (by appointment) to accompany scheduled docent or educator led group tours. To schedule an ASL group visit, please contact access@nyhistory.org or call (212) 485-9232. Verbal-description docent-guided tours for select exhibitions are available by appointment and are free with museum admission. Please call (212) 485-9232 to make an appointment. New York and the Nation features a free iPad/iPhone app optimized for use with Apple’s VoiceOver technology and offering verbal descriptions of all 150 objects in the Smith Gallery. Click here for more information. Text for all exhibitions is available in Large Print. Please pick up a copy either at the admissions desk, near the exhibition entrances or contact access@nyhistory.org. If you need more information about accessibility, please either e-mail your questions to access@nyhistory.org, or call (212) 485-9232 or (212) 873-7489 (TTY).